As such we rely on your article contributions to help keep us going. Anyone can contribute to any section. There are plenty of ways for you to help, check out the list below, and for most articles we have a simple template to help you provide the information we need. We're just trying to make it that little bit easier for you. story about how you got involved with Minis. As for photos, in the first instance we ask if you know of any friends or club members - maybe even yourself - who has an interest in photography and would be willing to do it for free. If you can't find anyone, we will do our best to find a volunteer who will do it for us. Fitting something to your Mini? Got to fix something? Take your camera with you and then send us a step-by-step guide of how you did it. We get all our articles checked for technical accuracy and safety. 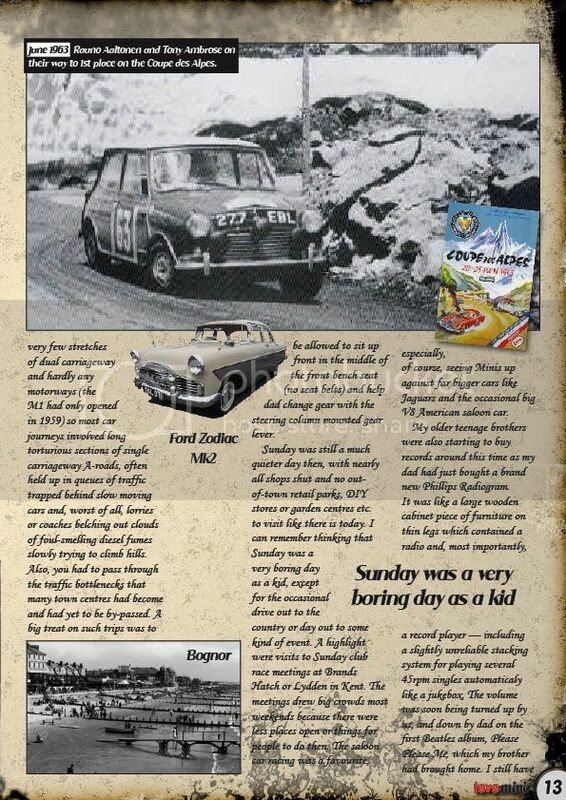 Have you got a particular story to tell of adventures in your Mini? Jot it down and share your exhilarating experience with others - we DO want to hear - and if you have pictures - even better! Got any old photos of classic Minis pre-2000? Show them off and let everyone see what kind of world the Mini was living in and how they lived at the time. Going to a show or joining a run? Is there a burning issue which you feel strongly about, or something trivial that has bugged you and has become a big deal - let us know, blow your top and spit it out, let off steam and have a rant to us. We love it. Are you a member of a club? Want to get them some cool publicity. We have an easy-to-complete template that helps you write it easily and quickly. All you have to do then, is send us some photos of your club having fun! Tell us about your favourite Mini driving road and why it is so great. Tell the world about your recent exploits, trials and tribulations with a diary page. Don't forget to keep us updated with products, events, news and announcments, by adding us to your mailing list - editor@love-mini.co.uk.